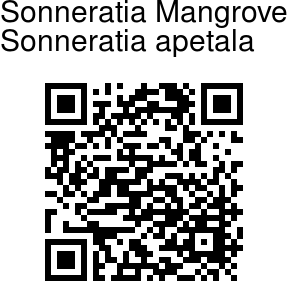 Sonneratia mangrove is a small to medium size columnar tree, which can attain a height of about 20 m and a girth of about 2.5 m. The tree occurs on newly accreted soil in moderately to strongly saline areas and is considered as a pioneer species in ecological succession. The species is distributed in India, Bangladesh, and Myanmar. The leaves are simple opposite, entire and leathery. Bark thin, light brown, irregularly fissured. Flowers apetalous, cream coloured, arranged in axillary 3-flowered of 7 flowered dichasial cyme. The flowers have no petals, but 4 prominent green sepals. 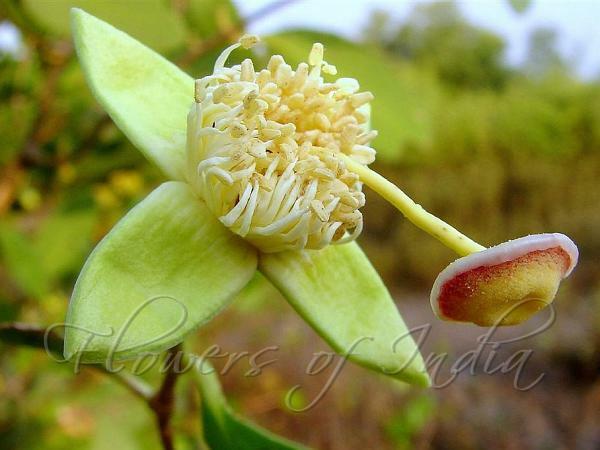 Cream colored mass of stamens give the flowers a cream colored look. The most interesting part of the flower is the style , which consists of a white, 2-3 cm long, curved, stigma, falttened like umbrella or mushroom. The upper portion is reddish in color. Fruit is 1-2 × 2-2.5 cm in diameter. Seeds are typically U-shaped or sickle-shaped, 8-9.5 mm.